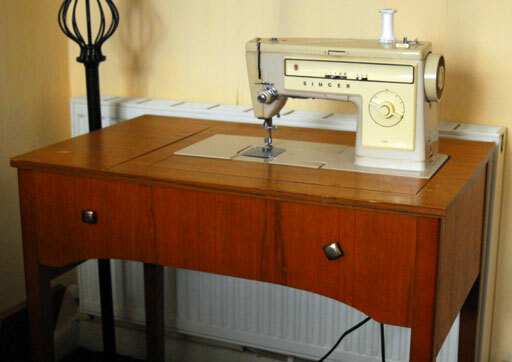 This is the sewing machine my aunt gave me as a wedding present. I’ll give you the tour. You can see that it sits down into the table. There’s a drawer on the far end. It doesn’t look like it but it goes from a stitch so tiny it’s almost sewing on the spot to a stitch as wide as my thumb nail. It’s got a pile of seam allowance guides. 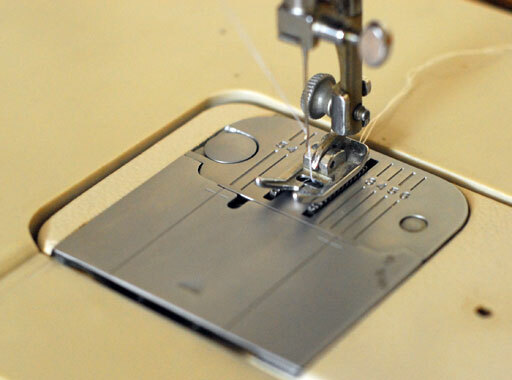 I really missed having that on my old machine but as I found out yesterday, it still doesn’t mean I can sew in a straight line. Part of it is just a plastic cover that slots out. 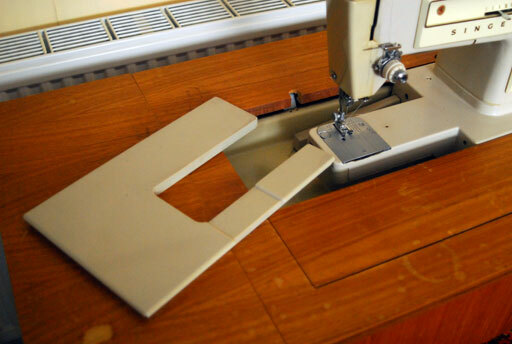 This is really handy for sewing things like sleeves. …so you can fold the flap the machine is connected to down into the table. The flap folds back down and there’s another bit that you slot in to complete a solid table. The drawer at the front is just pretend. 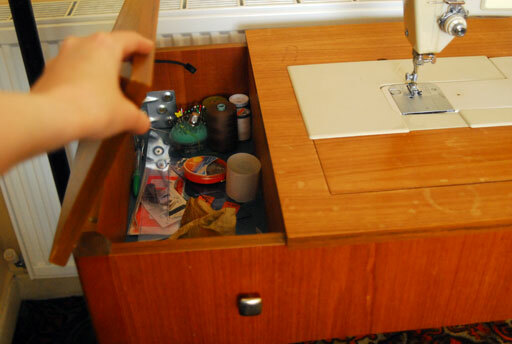 You can store the extra bits that complete the table/machine in the drawer at the end when you don’t need them. 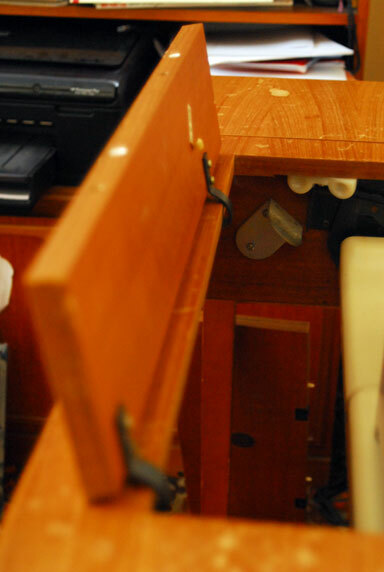 The power cord goes up in under the table and is totally out of the way. It’s possible to detach the machine and use it separate from the table, of course. But the whole thing is pretty neat and it sews wonderfully. 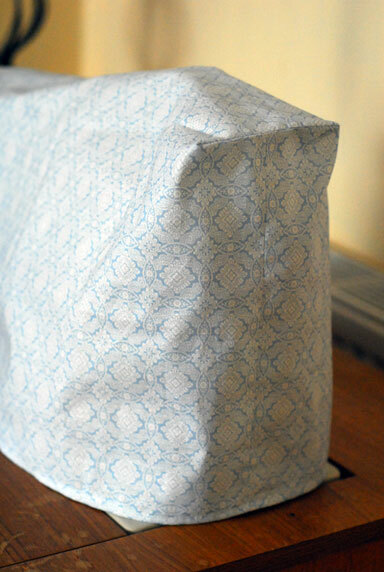 Obviously, the first thing I had to do was sew a cover! 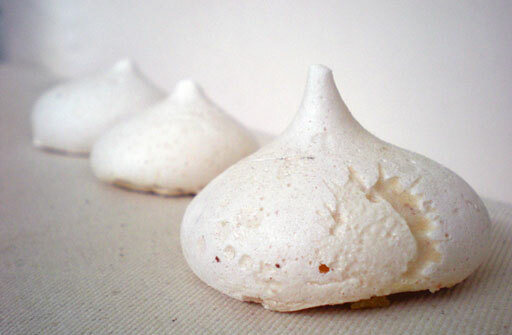 I was the flea market yesterday and picked up a few meringues from Caryna. She had all manner of nibbles, like biscuits, brownies and rice-krispie buns. I got these because they were cheap. I hadn’t been to the flea in months because I’ve been so busy. I stayed about an hour, I had an espresso and a rice-krispie bun and browsed about. I found a lovely fuschia halter-neck knee-length dress for €5, perfect for playing in. And I picked up a few gluten free supplies in the co-op. Remember yesterday how I said that I’ve been having problems with my sewing machine? 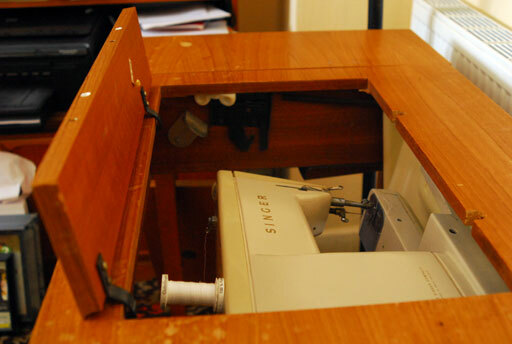 Well, long story short, my aunt ended up giving me a vintage Singer tailor’s machine as a wedding present. We went and picked it up on Saturday. It has all the things my old Brother lacked: a slow, controlled start; good variety of stitch width and length; moveable needle; seam guides; no bobbin problems. It doesn’t do any fancy stitches, just zig-zags, but I haven’t had a situation yet where I found myself wanting. Apparently there is a box of additional pieces that I’ll be able to pick up next week so hopefully there’ll be a zipper-foot included. 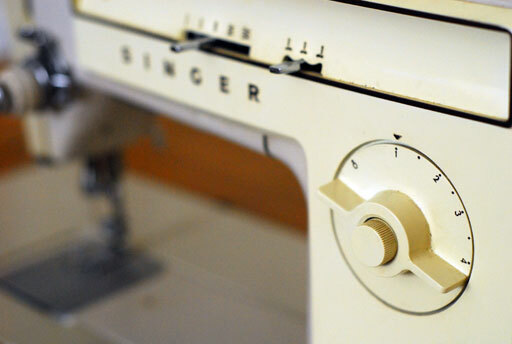 My aunt had it serviced and, as a woman that taught dress design most of her life, I’m pretty sure it’s not going to give any problems. It comes with a table that it sits into and can be folded away (though we haven’t figured that bit out yet). When I get it all set up, I’ll post a picture! After some… issues with my machine, I finally got this finished off. 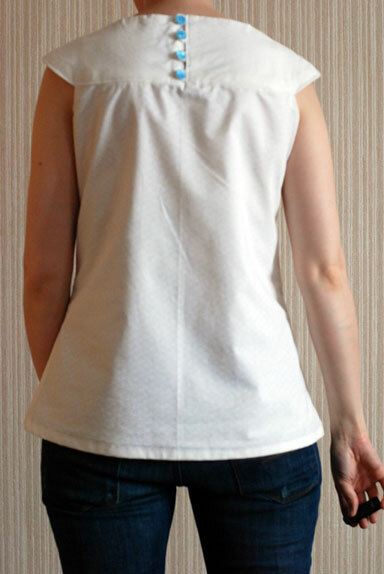 It’s the ‘Cami’ view of the ‘Anna’ Tunic pattern by Amy Butler. I made the dress before Christmas so I expected this to be easier than the first time. It was but I still had a few issues. All user error, I assure you! 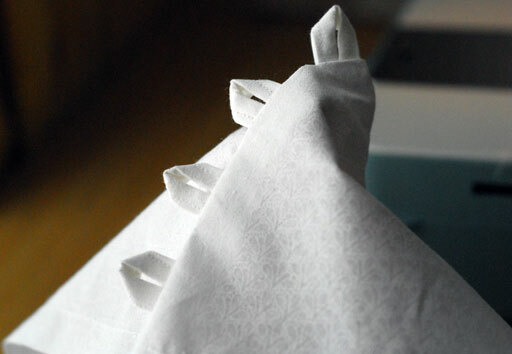 The material is a white cotton with a matt white, small floral print. It is a little bit curtain-y but worked well for this top. I think I used about a metre and had about half a metre of lining left over that I used for lining the body. 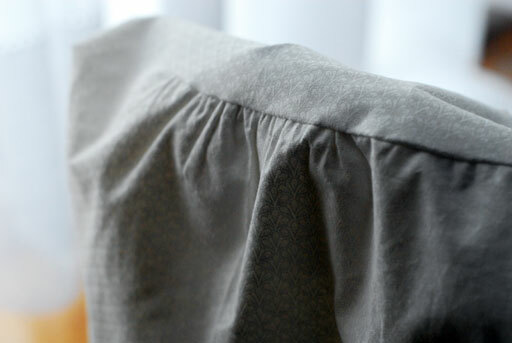 The yoke is lined with fabric so you could choose not to line the body if you didn’t want to. The button loop closure works really well for this pattern. 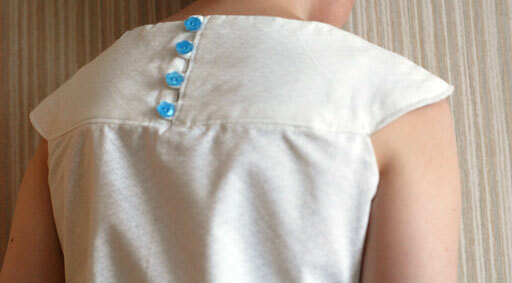 Unfortunately I was dozing a bit the day I sewed the loops into the yoke and managed to sew them onto the wrong side. I suppose it wouldn’t have mattered but I quickly realised that I could just flip the loops inside out. They don’t lie quite as nicely as they originally did but it’s not noticeable. I found the top stitching around the yoke tricky enough and ended up with one or two small tucks. If you look closely around where I stitched at the back opening, you can see where I had a bit of a wobble due to the sudden thickness of fabric from the button loops, but you have to look really closely. I wasn’t expecting that to happen so I’ll know for again! The buttons I got in Amsterdam that time we were on our way to Thailand. So, these user errors! I have to say I found hemming the darned thing the hardest part of all. Because the shape is quite A-line, I was getting an excess of fabric and it took very careful manipulation and tacking so that I avoided tucks. I expected the same from the lining but it was no problem. I did have a problem with the lining because I managed to cut the back piece too large. I just couldn’t get it to fit into the yoke properly so I ended up having to gather it slightly and ease it in. I also had a problem with the fit of the yoke across the arms. 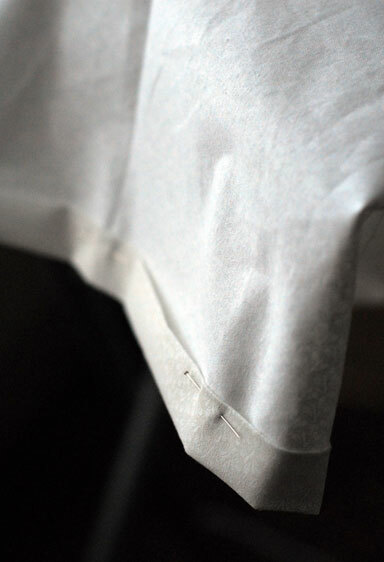 I don’t have a seam allowance guide on my machine and I ended up sewing nearly a 2cm seam by accident. I didn’t realise until I had the yoke completely finished, at which point I really did not feel like taking it all out again. My mum suggested that I let it out a bit at the underarm to relieve it. I’d already trimmed the seam allowance but I was able to let it out by about half a centimetre. I didn’t think it would make much of a difference but it really did. It looks ok with a cardigan over it, too. Before Christmas, I made Amy Butler’s Anna Tunic. I made the dress version in a wool/cashmere and lined it in a heavy silk/satin. I wore it a lot during the snow but otherwise, it turned out almost oppressively warm! I really enjoyed making it, though, and vowed to make a more summery version. I picked up a medium-weight cotton in Trimmings the day I got the navy polka-dot stuff and had some cream lining left over from the Socialite dress. Got my seams to line up in the yoke. Managed to cut out part of my yoke lining in the wrong direction. It doesn’t matter because it’s just for the lining but I’d the whole thing sewn together before I noticed. Grain lines matter! Button loops worked out well until I realised that I’d sewed them into the wrong side of the yoke. I pushed them around so they look ok but they don’t lie as flat as they were. Thanks to the vast amount of gathers on the Socialite dress, working the gathers for the front of this wasn’t too problematic and I think I avoided any noticeable tucks. 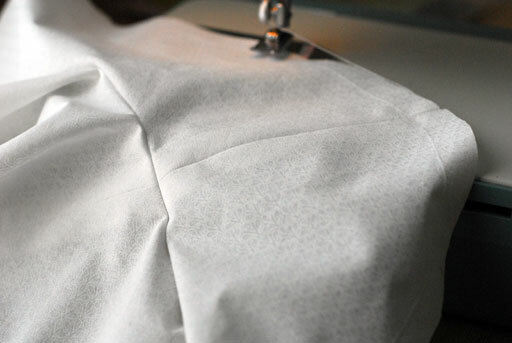 I had to run a gathering thread through the lining for the back panel because I cut the piece a little too generously. A tiny amount of gathers helped me ease it in when I sewed it to the yoke. I had other issues with the yoke that I’ll talk more about when I finish off the top… All entirely of my own doing, of course! Just some hemming to do and it’ll be ready to wear. I started this before Christmas. I had just finished my Anna Tunic and was on a dress-making high. I had seen many pictures of the Socialite Dress on Flickr so I thought I would give it a whirl. I used some really old fabric I had stashed away. It’s a cotton/elastic mix and I think I must have had about two metres of it. The problem is that it is very see-through so I made the decision to line it, even though it’s not in the pattern. This altered the final drape of the dress, as you can see. It is a bit stiffer. As you can see, there is a mega amount of gathers. This was all fine but when I came to do the lining, I had to do the same thing all over again. It was tedious but good experience. I think if I had a more drapey fabric, the sheer volume of gathers on the back wouldn’t balloon so much. Really, the deciding factor about this dress was the pockets. It has big pockets making it the perfect pottering-about-at-home dress. The pattern was good, if not as clear as the Amy Butler one, and all my notches lined up no problem. I’d like to try another of her patterns, the Roundabout Dress, in the recommended voile to try out sewing something more drapey.